Just when I thought I had seen and heard it all, when it came down to the fabric of this community, I take a Sunday morning tour with Christine Michaels and realized I knew nothing. I had spent the last 4 and a half years visiting Little Havana working on a visual arts project before I was introduced to Christine and Anneliese from the tour company and honestly without them, my project would not have been half as good as it is now, having spent time with them and taking this tour. Their knowledge of this community is unrivaled...their passion they wear on their sleeves. I've been on all tours all over from New York to Rome and they all seem to be the same...short, sweet and scripted. Not Little Havana Tours. This neighborhood not only caught my attention but stole my heart and after taking the tour, my love for Calle Ocho and the people who call this place home only got stronger. This is the best neighborhood in all of Miami and if you are looking to add culture to your South Florida vacation, this is a MUST!!! The tour and Ariel were a “10” where “5” is the highest ! I marvel at tour leaders who have the ability to do a tour over and over and yet make each group feel like they are the first and most important tour ever taken. Such is the skill of Ariel and for that we thank you. Everything was amazing--stories, insight, meeting locals, tasting delicious fresh fruit and hot meal. Saw the other large group for food tour. Grateful for this smaller VIP group. By the way the Art Deco tour was equally fabulous, both tour and tour director. Ariel was great tour guide. He was informative, expansive in his answers, and quite genial. Best guide I've had in walking tours (trust me I've been on a lot!). Loved the cigar/coffee shop, and the Ball & Chain. The tour was well rounded and touched on all the topics: cigars, clothing, history, and sports (dominos!) oh and the food!!! All in all money well spent. Best Food Tour & Value! We originally signed up for the culinary tour for out-of-town guests having taken it a year ago but it was cancelled and it was to our benefit. 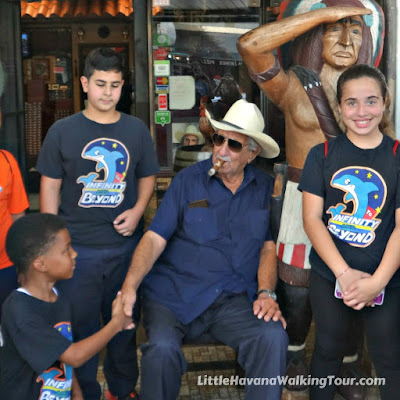 Thankfully we found this Little Havana Cultural Walking & Food Tour and we saw more, learned more, ate more and paid less! And we were relieved when we saw bus tour groups and culinary tour with large group and loud speaker while we were 5 people total on the Little Havana tour. So much more personal and comfortable, especially with the heat we could cool off in air condition and had access to sites other tours do not. The food was delicious and plenty! Warning, eat light breakfast or skip it! Locals clearly adore our tour guide Christine--so do we! If you live in South Florida you have to take this tour. So much more to this neighborhood than you realize.